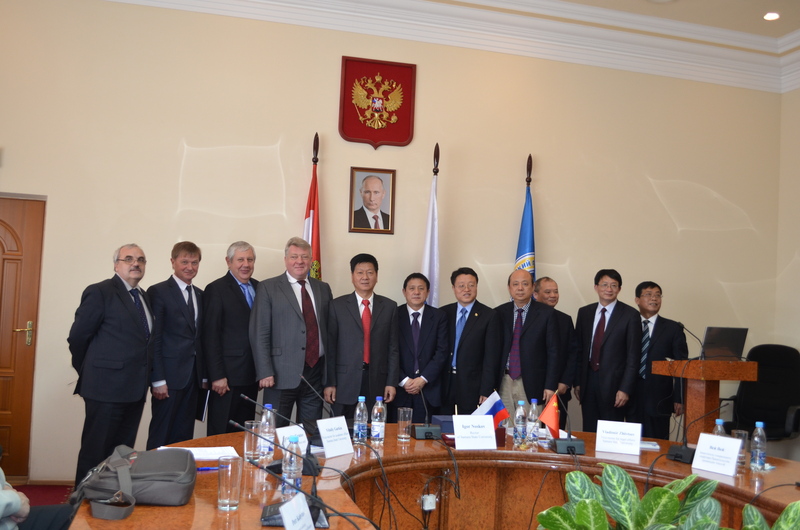 On 25th of April 2014 Samara State University received the delegation of Anhui Province of People's Republic of China. The delegation was headed by Mr. Wei Wei, Deputy Secretary General of the Anhui Province Government. Anhui Province Government was also represented by Mr. Lu Youqin, Deputy Director of International Relations Chancellery, Mr. Hu Qing, Deputy Director of Development Department of International Relations Chancellery and Ms. Wang Jun, Interpreter of International Relations Chancellery. Mr. Gao Kaihua and Mr. Geng Zunfang represented the Department of Education of the Anhui Province. Rector of Anhui Normal University Mr. Wang Lun, Rector of Anhui University of Science and Technology Mr. Yan Shilong, Vice-rector of Anhui University Mr. Wang Qunjing and Specialist of International Office of Anhui University Ms. Lin Jingjing were also on the delegation. The delegates of Samara Regional Government were Sergey Y. Chaban, Chief federal inspector for Samara Region, Larisa E. Zagrebova, Deputy Minister of Education and Science of Samara Region, Dmitriy V. Gorbunov, Deputy Minister of Economic Development, Investment and Trade of Samara Region, Vladislav V. Likhachev, Head of Youth Affairs Department of Samara Region. The objective of this meeting is to establish bilateral relations between Samara Region and Anhui Province in the spheres of economy and trade, education, science and technologies, provide a more thematic focus of collaboration opportunities. The meeting of Samara State University administration and the representatives of the leading universities of Anhui Province - Anhui University, Anhui Normal University and Anhui University of Science and Technology - resulted in signing the agreements of academic and scientific cooperation with these three universities. The Rectors discussed and indicated such priority spheres of cooperation as the exchange of undergraduate and graduate students, lecturers, researchers, joint researches and scientific projects in the spheres of mutual interests (IT, Physics, Economics and Management, Social and Human Sciences). Anhui University established the Center for Russian Studies. Thus, the parties agreed to encourage the studying languages, history, culture and literature of Russia and China.